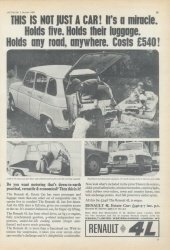 This page is not exhaustive; a complete list of what I have and have seen on the web can be found on the pub finder page. 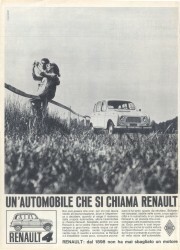 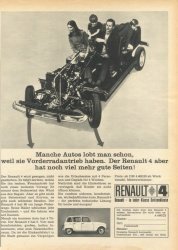 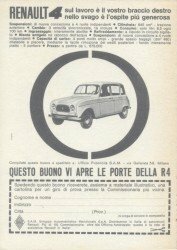 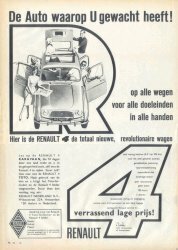 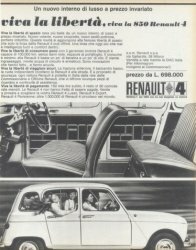 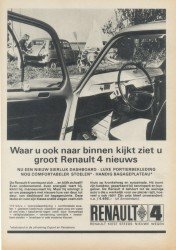 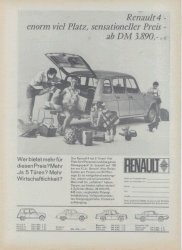 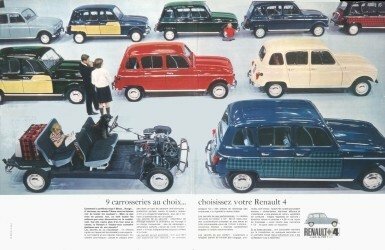 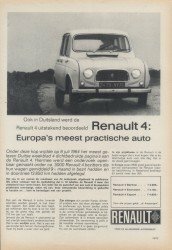 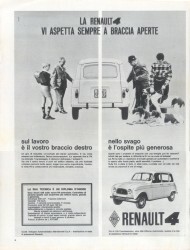 This page shows a number of R4 magazine advertisements published by Renault from the period 1961-1967 (the period of the first grille). 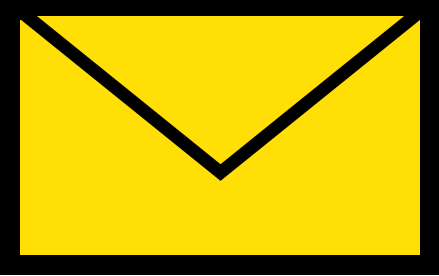 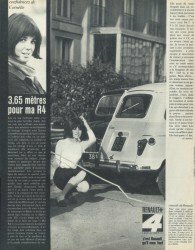 The majority are from French magazines, but Argentina, Belgium, Germany, Italy, the Netherlands, the UK, the USA and Switzerland and more also contribute. 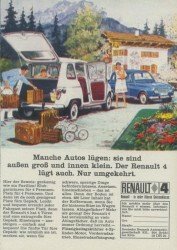 The order is roughly chronological, but I have also tried to keep series together, as well as ads from one and the same country. 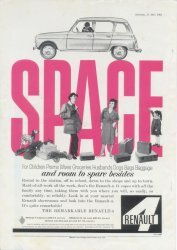 Shown directly below therefore is the oldest material I know of. 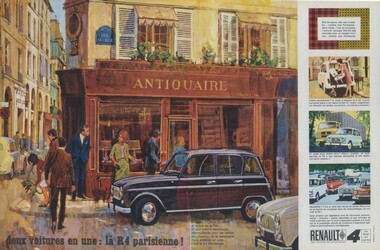 The picture was used in a number of countries (see the Spot the difference section for the various manipulations of the image). 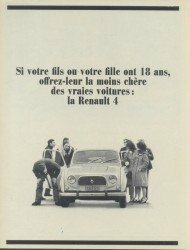 The French version reads 'the new renault' (which is also the slogan on the introduction brochure for all countries), the Italian 'an amazing car' and the Dutch 'the car you have been waiting for' (in two versions) . 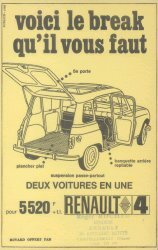 All mention the famous words 'Pas de graissage, pas d'eau, juste un peu d'essence' ('No greasing, no water, just a little gasoline'). 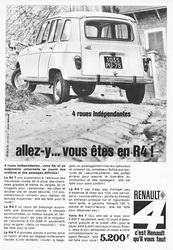 Some of the oldest advertisements I possess have 'Allez-y, vous êtes en R4' (Come on, you are in an R4) as tagline. 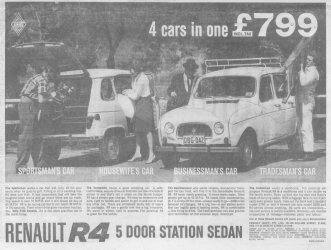 I believe that this simple sentence covers the essence of R4 so well that I chose it to be the title of this website, and start this page with it although some older ads follow later on this page. 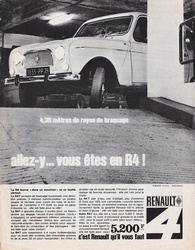 The Renault-logo is accompanied by the text 'C'est Renault qu'il vous faut' (It's Renault you need). 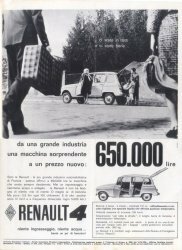 Several different ones exist, all aiming at technical advantages like the heating, 4 independant wheels, speed and size of the boot. 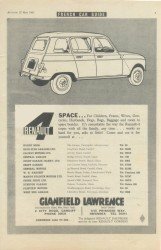 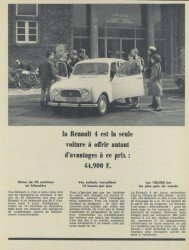 A Renault 4 would cost you only 5200 French francs those days! 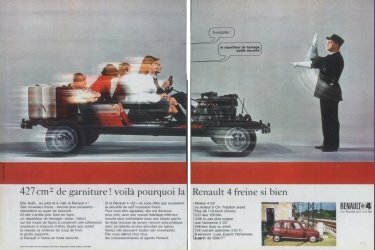 They are from 1964. 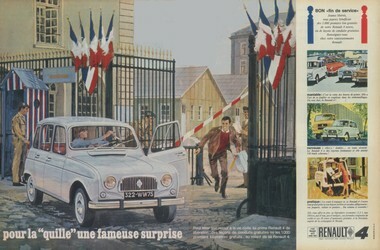 The green and blue picture one on the right hand side, by Savignac, is said to be from 1961, but some claim it to be 1962 or 1963. 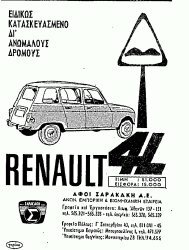 Quite rare are these three from Greece. 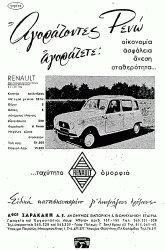 I don't speak Greek and I don't have the originals, so I am not even sure if they are advertisements or brochures. 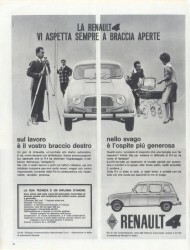 The first two show the front tubular bumper and tripode hubcaps. 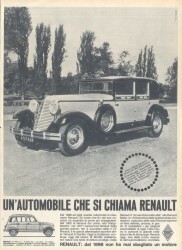 The latter is remarkably similar to its French counterpart. 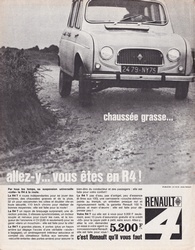 As said, some advertisements predate the 'Allez-y' series. 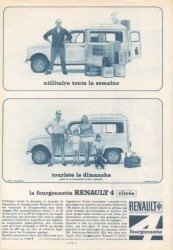 Here are some that are hard to date, among which two about the Fourgonnette (I know very few Fourgonnette ads). 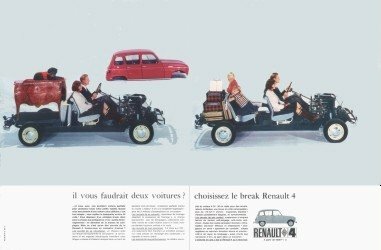 The first one shows mademoiselle Cornélie, who appeared in more advertisements, which deserve to be shown on a separate page. 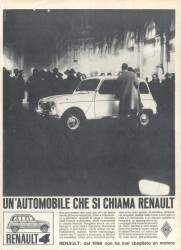 On the far right an advertisement from a november 1964 'El Pueblo' issue showing the Spanish Furgoneta. 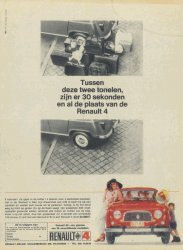 From the Netherlands is 'Europe's most practical car' (1964). 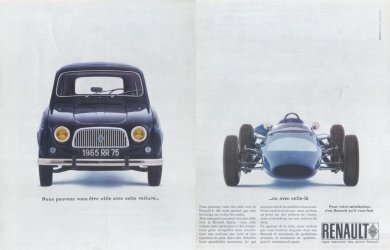 The right one is from 1963, Germany. 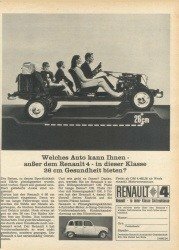 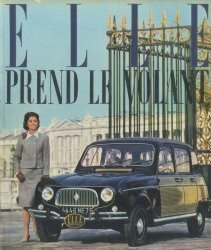 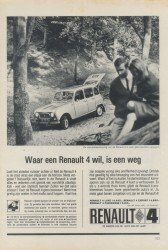 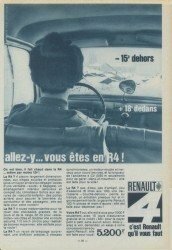 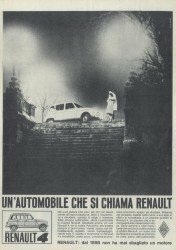 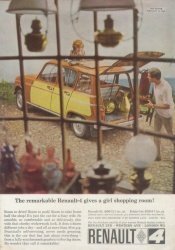 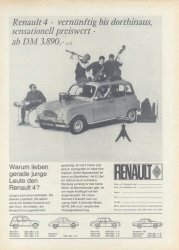 In 1963 Renault and Elle devoted a number of articles to the 'Elle prend le volant' ('she takes the wheel') campaign, in order to get more women to buy a Renault 4. 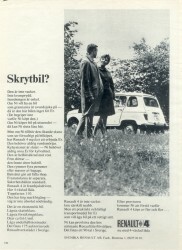 The third picture from the left features model and yeye-singer Sheila. 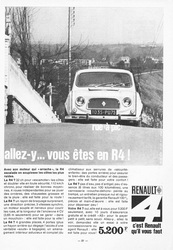 Apparently, she was contracted by Renault as she also appears in the 1964 magazine and here in the People section. 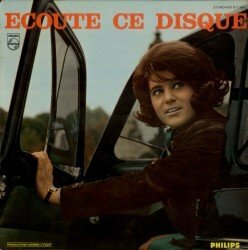 On the right, the cover of her LP '�coute ce disque' features Sheila and her Parisienne. 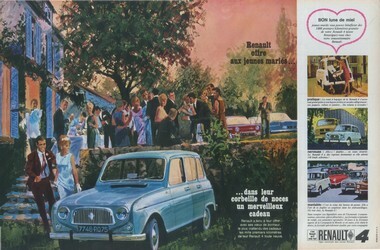 The same car appears here in the movie section, during a performance of 'Vous les copains'. 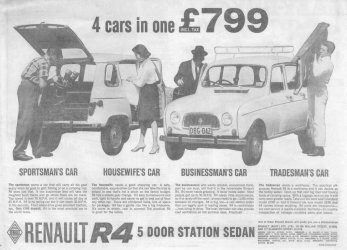 Rumour has it that the car still exists. 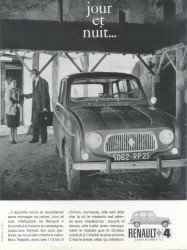 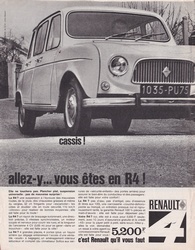 A bit later, about 1965, is a series still carrying the 'C'est Renault qu'il vous faut' slogan. 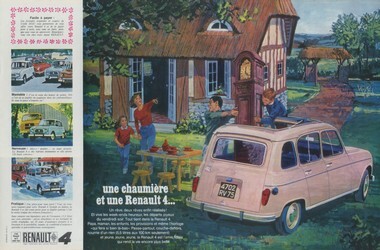 No photos this time, but a series of nicely drawn picturesque scenes, by Philip Keller. 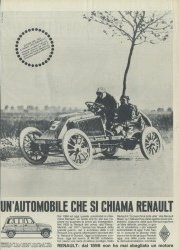 One of them, showing a wedding, offers the first 1000 kilometers for free to newly weds. 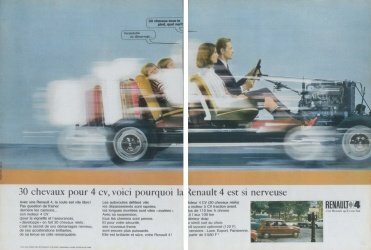 On another one, picturing a university, Renault 4 offers free driving lessons. 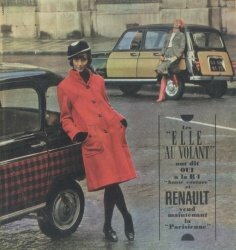 One is devoted to the Parisienne. 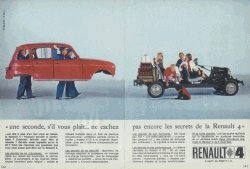 The keywords are: pratique, nerveuse, maniable. 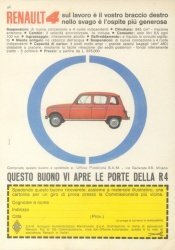 From Italy, one from 1962 and a couple of unknown age but probably between 1962 and 1965. 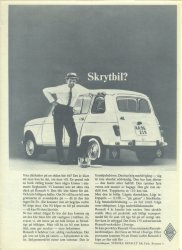 A slogan reads something like 'The work it does for you is your right arm' (if someone knows the correct translation, please let me know). 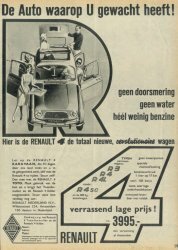 The last one reads 'The R4 is always waiting for you with open arms'. 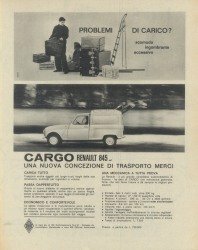 On the right, one about the Fourgonnette, in Italy called the 'Renault 845 Cargo', about 'problemi di carico' (cargo problems). 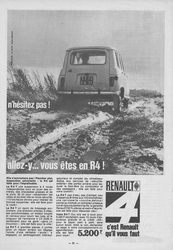 Also from 1965, a nice one suggesting that the R4 benefits from Formula-something racing cars. 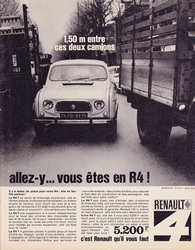 This time the slogan reads 'Pour votre satisfaction, c'est Renault qu'il vous faut'. 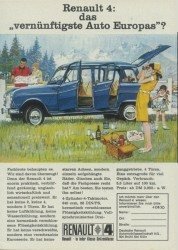 A couple of German ads, assumed to be from 1965 too, emphasizing the low price of DM 3890. 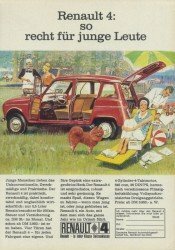 'Letzte Weisheit f�r die Eiszeit is translated into something like 'Last wisdom before the Ice Age' and something like 'You cannot discard winter, but you can buy a car that can handle winter'. 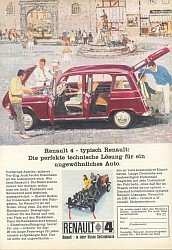 The last one, 'Tip for young folks' resembles the German 1967 and 1968 advertisements in style and slogan ('Jeder Klasse Spitzenklasse'), but the price attributes it to 1965 or 1966. 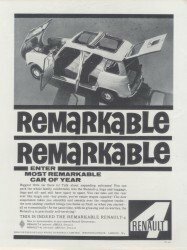 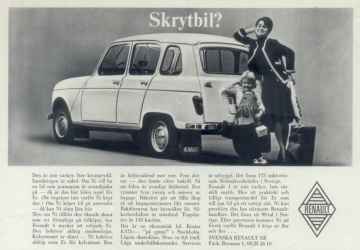 The R4 is referred to in Sweden as a 'skrytbil' (a car to be proud of; the term is used frequently in brochures too). 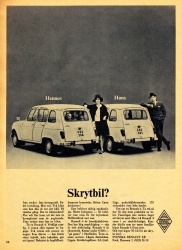 The car is advertised as a car for her and for him ('hennes, hans'), businessmen, women and children, and craftsmen. 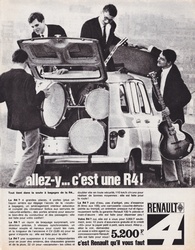 For 1966, one from Belgium, two from the Netherlands and two from England: 'Between these two scenes, there's 30 seconds and all the space a Renault offers' and 'Where a Renault wants to go, there's a road (this one also refers to the 'Vrijbuiter Club' or 'Privateers Club', a Renault 4 club that was apparently officially affiliated to Renault. 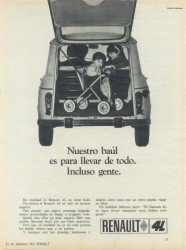 It does not exist anymore). 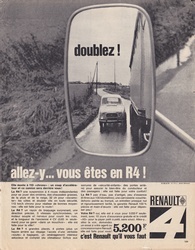 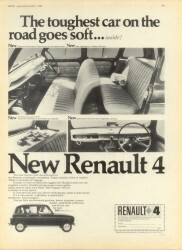 The third one, 'Wherever you look inside, you'll see breaking Renault news', refers to the new dash introduced in 1967. 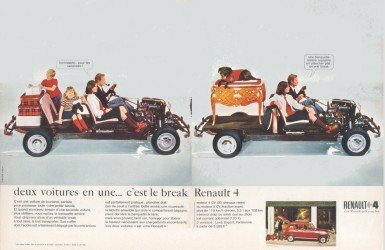 On the right hand side, 'The toughest car on the road goes soft' emphasizes, among other things, the new soft seats introduced in 1967. 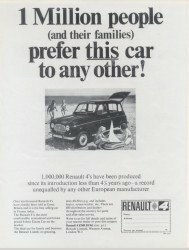 'One million people (and their families) prefer this car to any other' informs us that, that since its introduction 4.5 years ago, 1,000,000 R4 have been produced. 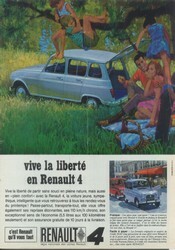 In 1967, a new series of advertisements was published. 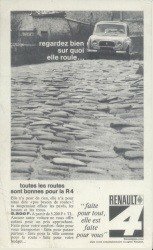 The photos can also be found in the red brochure from the same year, as well as in the booklet 'La R4 de papa' (which also contains a number of drawings of photos from the 1968 blue brochure). 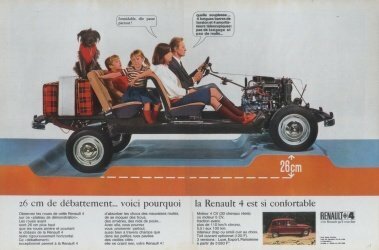 A couple show a happy familiy (father, mother, daughter and son) sitting on a mere chassis. 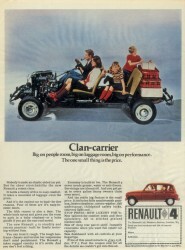 The same family photos were also used in the UK in 1967 (mirrored, of course, and using the name 'clan-carrier'), and re-used in Germany in 1969 (with the new 1968 bumpers). 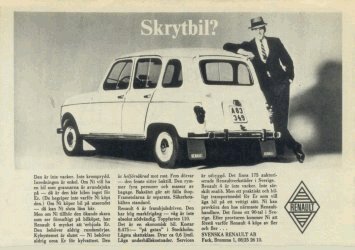 To the right, another Swedish Skrytbil from 1967. 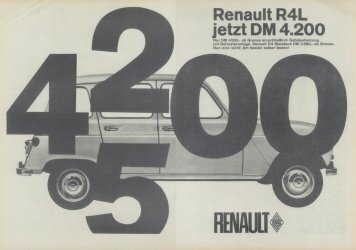 Here is a nice series from Germany again. 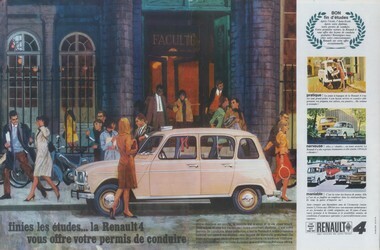 The style reminds one of the 'C'est Renault qu'il vous faut' series by Keller. 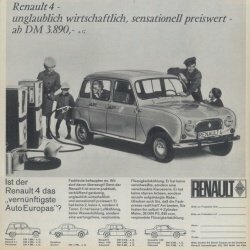 Judging from the details (first and second grille, second beige dashboard, chassis family, some mention 4 gears) they must be from 1967 and 1968. 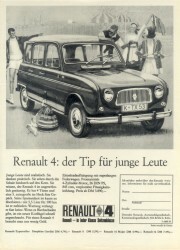 The slogan reads 'in jeder Klasse Spitzenklasse', which would translate into something like 'in every class top class'. 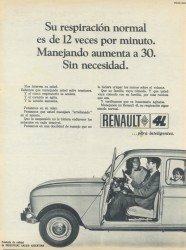 In Argentina, in the same year, a different set of publications from IKA (Industrias Kaiser Argentina, the company that produced the R4 for South America). 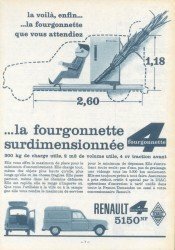 Somewhere on the page it reads 'Renault 4. 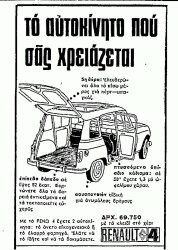 For intelligent people'. 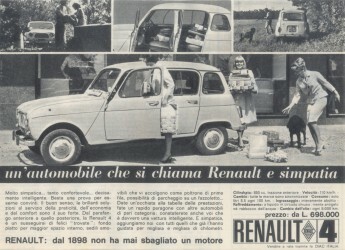 On the right hand side one from Italy, mentioning the new interior. 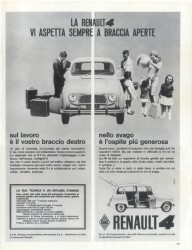 Continue to the 1968-1978 section.